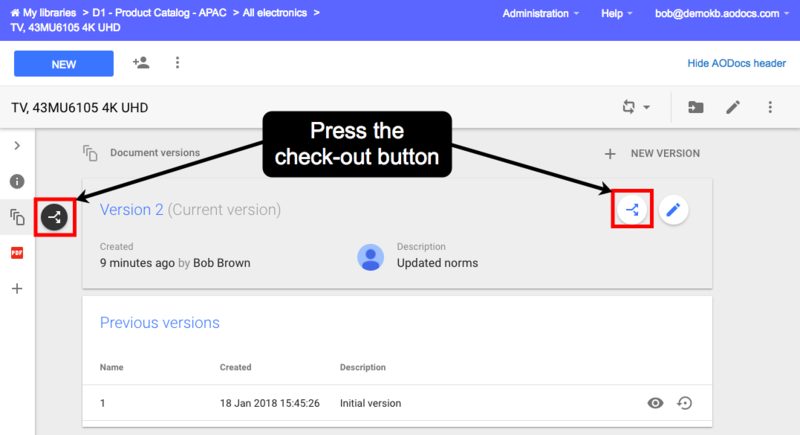 Check-out is an action that creates a draft version of an AODocs document. A subset of users can update the draft. All users who had access to the document before the check-out can access the main version of the document, in read-only. When a check-out is manual, the draft is accessible only to the user who performs the check-out. This user can then authorize other users to access the draft. - If a check-out was triggered manually, the check-in must be manual. - If a check-out was triggered through a workflow, the check-in must happen through a workflow transition. Learn more: Workflow example with version control. In your document, select Versions in the left panel and press the Check-out button. A new draft version of the document is created. By default, only the user who created the draft and library administrators can view and edit it. As the creator of the draft, you can share the draft version with other users if you want them to view or edit it. In the list of documents, users who have access to the draft version of the document can see a lock icon to the left of the document title. Users who don't have access to the draft version don't see the lock icon. - If you have access to the draft, the view displays the properties and workflow state of the draft. - If you don't have access to the draft, the view displays the properties and workflow state of the main version. Users who have access to the draft version of a document can press the link to the main version from the check-out banner in the draft version. Note: Users who don't have access to the draft version see the main version when they open the document. The banner and tag aren't displayed. 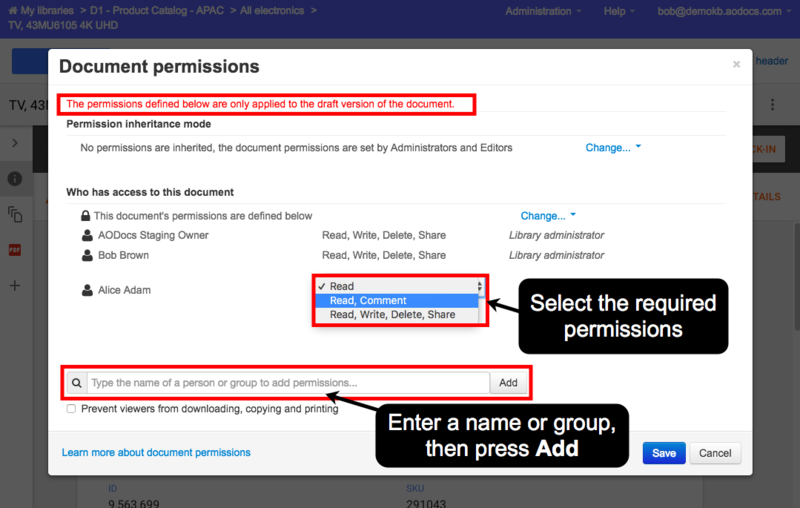 As a contributor of the draft or as an administrator, you can share the draft version with other users. Note: Contributors of the draft version, including the user who checked out the document, can't update the sharing permissions if library administrators have forbidden contributors to update the sharing permissions at the document class level. Important: Changing the permissions in the draft version affects only the draft version. The main version is not affected by these permissions changes. 1. Press the Edit document or folder permissions button in the action bar. The Document permissions pop-up opens. 2. Enter the name of a person or a group. 4. Select the required permissions for the person or group you added. When you have edited your draft version, you can check it in to validate it. Alternatively, you can cancel the check-out to discard the draft version.